According to a report by the Center for Economic and Political Reform (CEPF), the number of social and political protests in Russia has risen sharply compared to the beginning of the year. The number of protests has been continuously growing in Russia throughout the year. In the first quarter, 284 protests were recorded; in the second quarter, 378; and in the third quarter, 445. Thus, as noted in the report, the overall number of protests has increased by almost 60% since the beginning of the year. The analysts at the CEPF divide protests into political protests, socio-economic protests, and labor protests. They note that around 70% of protests had to do with socio-economic issues, including protests by Russian truckers against the Plato road tolls system, and protests by Russian farmers against the seizure of land by agroholdings, as well as protests by hoodwinked investors in unbuilt cooperative apartment buildings. Political protests came in second place, including protests by supporters of opposition leader Alexei Navalny. A total of 106 political protests were recorded in the third quarter of 2017. There were 27 labor protests in the third quarter. The number of conflicts related to labor relations has also steadily climbed throughout the year. The number of protests caused by cases of late payment and non-payment of wages, for example, has grown as follows: 142 in the first quarter, 196 in the second quarter, and 447 in the third quarter. Thus, by the third quarter, the number of such incidents had more than tripled. The authors of the CEPR report cites figures provided by Rosstat, according to which the amount of unpaid back wages in Russia totaled 3.38 billion rubles [approx. 49 million euros] as of October 1, 2017. The number of incidents of late payment and non-payment of wages in the third quarter of 2017 (447 companies) was more than triple the number of such incidents in the first quarter (147 companies), and more than double the number in the second quarter (196 companies). The analysts point out that Russia has not yet put in place a system for preventing and constructively solving social conflicts, and thus protests are still nearly the only effective means for employees to defend their rights. “We should generally expect the high number of protests nationwide to continue, especially in the socio-economic realm. This is due to the fact the problems people (hoodwinked investors, truckers, farmers, opponents of construction projects, environmental activists et al.) have been currently protesting have not been solved. At the same time, evolution of the protest movement has been greatly hampered by the lack of capable political parties, grassroots organizations, and trade unions,” write CEPR’s analysts. Russian President Vladimir Putin has proposed legislation to widen the responsibility of the National Guard, an entity created last year and headed by Putin’s former chief bodyguard, to include protecting regional governors. The bill was published on the website of the State Duma, the lower house of parliament, on November 6. The Duma is dominated by the Kremlin-controlled United Russia party and supports almost all Kremlin initiatives. The proposed change could enhance Putin’s ability to crack down on dissent or seek to impose order if there is unrest in Russia’s far-flung regions. The National Guard reports directly to the president. Its director, Viktor Zolotov, was chief of the presidential security service from 2000 to 2013. The initiative comes months before a March 18 election in which Putin is expected to seek and secure a new six-year term. Putin will be barred from seeking reelection in 2024 if he does win a fourth presidential term in the March vote, raising questions about how Russian politics will play out in the coming years and how he will maintain his grip. Putin established the National Guard (Rosgvardia) in 2016 on the basis of the Interior Ministry troops and other security forces. Its stated tasks initially included preserving “social order,” fighting against terrorism and extremism, and guarding state facilities. The National Guard announced that it will be also responsible for a fingerprints database, issuing weapons-possession licenses, averting “threats to state order,” and protecting information security. The final performances by Voina’s so-called Petersburg faction could be termed “actionism of fact” by analogy with “literature of fact,” a project the LEF mob tried and failed to realize in the 1920s. Voina took ordinary actions from the repertoire of protest and resistance, actions requiring no special skills—turning over a police car, torching a paddy wagon, dousing policemen with urine—and simply did them in their performances. What happened to the performances due to their actions? The actionist readymade (or “readydone”) and actionism of fact, unlike the classic artistic readymade, have no need of a special aesthetic space, such as a museum. Unlike literature of fact (if this literary project had actually been implemented in the twenties), actionism may well avoid the traps of language and representation. Voina thus directly took on the issue of politically effective action. There is a certain actionist Platonism to it, but if we bypass Plato (no matter how we regard the violence of his gesture) we cannot ask ourselves about art’s attitude and access to politics. In the Republic, Plato does not suggest banishing all poets for fobbing off the phantom of excellence (εἰδώλων ἀρετῆς) on citizens instead of virtue (i.e., the thought of action). He would let the non-mimetic poets, who glorify the gods and sing the praises of good men (ἐγκώμια τοῖς ἀγαθοῖς), stay in the city. Voina’s Petersburg faction non-mimetically sang the praises not of citizens themselves, but certain actions as such, simply by performing them. Their implicit message was something like: Look, this is up for grabs for everyone, and yet if you carry out this glorious deed, you will not be unoriginal and overshadowed by us, because this is basically something anyone could do. This is a kind of democratic and non-hierarchical political Platonism. Voina did these performances before the May 6, 2012, clashes between protesters and police on Bolotnaya Square in Moscow. They seemingly had offered the demos who took to the streets a possible repertoire of elementary actions. (Of course, the total number of such actions is much greater, and not all of them are either criminal or so primitive. What matters in this case is only the dimension itself.) But the demos did not heed their call, preferring to play at making witty posters, from the December 2011 rally on Sakharov Avenue to this day, and exchanging anti-regime memes in the social networks. (That is, the circumstances are in some way symmetrical to the exile of the poets. In this case, however, the demos itself has turned its back on genuinely political artists, immersing itself in the carnivalesque mimesis of the meme.) By rejecting the dimension of the glorious deed, however, the demos has refused to be itself, because it is eventful, rather than substantial, in contrast to the phantasm of the ethnos. It took Pyotr Pavlensky half a dozen performances to get close to the place where Voina had arrived in the spring of 2011, that is, in order to torch the front door at FSB headquarters in Moscow. In many ways, the performance was a step backwards, for example, when it came to the question of withdrawal. The guerillas of Voina insisted on retreating in a well-conceived way and unexpectedly returning to strike again. (This is the only worthwhile “We’ll be back!” It is a far cry from Navalny and Co.) But Pavlensky, in many respects by way of accommodating an aesthetic impulse, stood his ground to the bitter end. He has thus proven to be a more direct follower of the National Bolsheviks than Voina when it comes to this issue. So Voina is still waiting for its demos and valiant citizens back in the spring of 2011, scornfully gazing at rubber duckies, meme politics, and witty anti-Kremlin t-shirts. Translated by the Russian Reader. Sergey Yermakov is a professional translator who was involved in several of Pyotr Pavlensky’s performances. My thanks to Mr. Yermakov for his kind permission to publish this essay here. The other day, a friend of mine who works with kids complained to me that kids in Russia had no real heroes. Like kids most everywhere, they are in love with the wretched, hyper-commercialized Spider-Man and Harry Potter, not with homegrown heroes. It might be a bit of a reach (because how do you explain this stuff to kids? 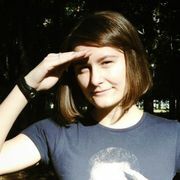 ), but from where I sit there are lots of heroes in modern Russia. Prominent among them are all the people convicted as part of the shameful sham known as the Bolotnaya Square case. One of those heroes is Sergei Krivov, recently released after serving over four years in prison for the nonexistent crimes of being beaten over the head with a truncheon by a policeman and attempting nonviolently to prevent policemen from doing the same to other peaceable demonstrators in Moscow on May 6, 2012. In the country I would like to live in, I would go outside and see dozens of people wearing t-shirts with Krivov’s totally ordinary but heroic face emblazoned on them. Krivov’s birthday would be a minor holiday, celebrated with a rousing march down every town’s main thoroughfare, followed by hearty little picnics, to celebrate the fact that Krivov undertook two hunger strikes, nearly dying in the attempt, in order to defend the freedom of speech and assembly in Russia. Needless to say, Krivov’s would be a household name. Kids would read comics about the adventures of Sergei Krivov, where the hard facts would be mixed with a light helping of fantasy to make them more palatable to childish fancy. Yet another person convicted in the so-called Bolotnaya Square case, Sergei Krivov, a 54-year-old with a Ph.D. in physics and mathematics, has been released. Krivov was released from a prison colony in Bryansk Region, having served his sentence in full. In 2014, a court found him guilty of involvement in rioting and using force against police officers during a May 6, 2012, opposition rally on Bolotnaya Square in Moscow. Krivov received one of the harshest sentences in the case, three years and nine months imprisonment. His allies explained this was because the authorities avenged Krivov for the uncompromising stand he had taken throughout the trial. Krivov went on two lengthy hunger strikes. The first, to protest his arrest, lasted over forty days. During the second, he did not eat for sixty days in order to secure transcripts of the court proceedings. 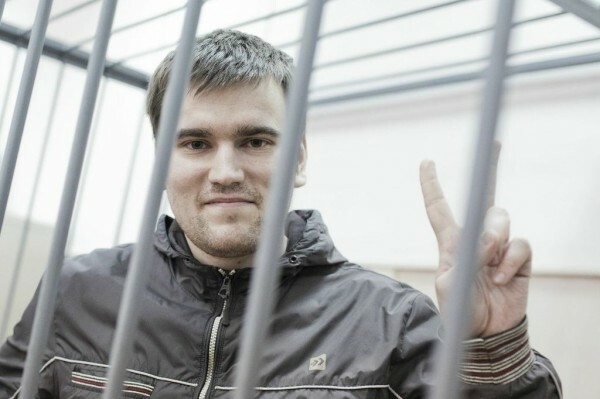 Krivov suffered two heart attacks during the second hunger strike. Krivov was arrested as part of the Bolotnaya Square investigation several months after the events, in October 2012. According to police investigators, on May 6, 2012, when the crowd broke through police lines, Krivov seized a rubber truncheon from a policeman and used it to deliver several blows to police officers. Krivov himself repeatedly claimed he had been beaten by police on Bolotnaya Square, but the Investigative Committee refused to investigate his complaint. Krivov served his sentence in two penal colonies in Bryansk Region, first at a correctional facility in Starodub. He was then transferred to a penal colony in Klintsy. The wardens put him in solitary, because they felt his life was in danger. In an interview with Radio Svoboda, Kriov admitted his sentence might have been shorter had he “kept [his] mouth shut.” He spoke in detail about the reasons for his uncompromising stance, what happened on Bolotnaya Square, and how much Russia has changed since 2012. The changes have been quite huge, and for the worse, although I still cannot say I have figured out what is what. I had been gradually following these changes by watching TV and reading Novaya Gazeta newspaper and New Times magazine, so they did not happen all at once for me and were not news. Nevertheless, I am perfectly aware the country as it was in 2012 and the country as it is in 2016 are two fundamentally different countries. There are far fewer freedoms, naturally, and It is nearly impossible to do anything within this framework. Do you feel you have changed over these years? In fact, after I got out, changed my clothes, and bathed, I had the feeling everything was as it had been. Although I did have big problems during the middle of my sentence: lots of things happened. But when it is all behind me, when I have come back to the “free” world, I cannot say I have changed. I think I am the same person I was. Have you managed to meet with friends and relatives since your release? What are your impressions from these meetings and conversations? Of course I have managed to meet with them. Let me put it is this way: almost no has chewed me out, except my wife, of course. In general, the feelings have been positive, because everyone has been friendly. They all congratulate me and wish me the best. Naturally, anyone would find this pleasant. I want to say thank you to all the people who wrote me letters, held pickets, and collected money through the Internet, and to the leaders of the PARNAS Party, who paid my lawyers and sent me care packages: Boris Nemtsov, Mikhail Kasyanov, Vladimir Ryzhkov, and Ilya Yashin. In addition, Lyudmila Alexeyeva was involved. Despite her age, she attended the court hearings. A big thank-you to everyone for their support. Last Wednesday, you also met with activists in Sokolniki Park. You mentioned you had no hope of being paroled. 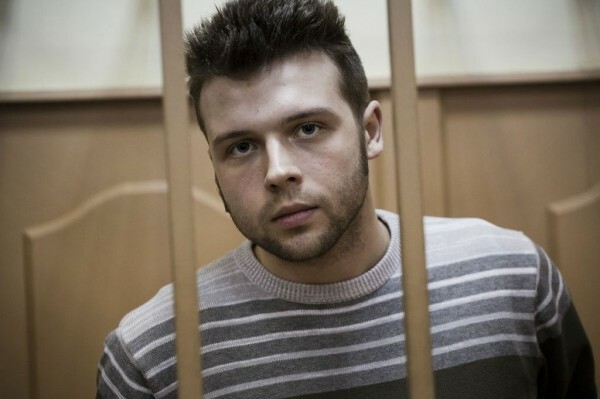 [In March, the court turned down Krivov’s parole application — Radio Svoboda.] Did you pin any hopes on the court in this case, that is, the trial court that heard the Bolotnaya Square case? No. We had no chance from the get-go. What would have been the point of cooking all this up and then releasing us later? Obviously, the authorities conceived a quite definite plan, and they have been carrying it out. From my point of view, there was no reason to change anything, and nothing changed. I had been detained on misdemeanor charges several times., and I knew perfectly well how such matters were decided. There were no doubts in this case. And yet your tactics in court were quite different from those of the other fellows. You were one of the most active participants in all the court proceedings. Yes, I was, because I felt it could not make things any worse. That is how it happened, if you look at the sentences handed down. Naturally, my sentence would have been shorter if I had kept my mouth shut. But here, you know, six months more, six months less do not matter. Naturally, we had to defend ourselves to the hilt. After all, we did not take to the streets only to snitch on the protest movement, to put it crudely. We did not do what we did to make the court rule in our favor. It was a continuation of the protest. Pavlensky said it: court is a continuation of my protest action. For me, it was simply a continuation of the opposition’s fight. 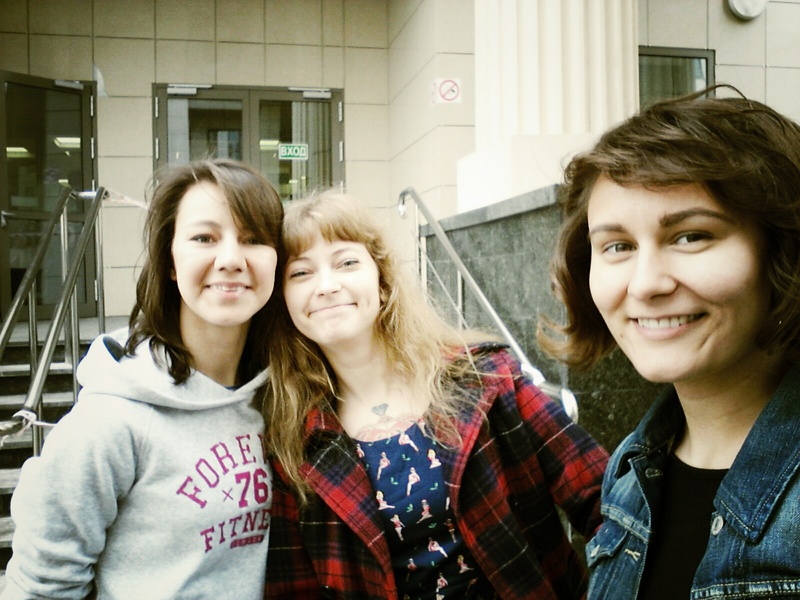 It can happen anywhere: in court, outside of court, on Bolotnaya, away from Bolotnaya. It is like a way of thinking. It is as Solzhenitsyn put it: “Not living a lie.” Every single moment you do what you think is right. The situation changes, but the individual does not change in the situation. Were your fairly long, serious hunger strikes also a continuation of this same story? What prompted you to do it? Do you remember what you felt when you decided there were no other methods left? During both hunger strikes, I was perfectly aware my demands would not be met. I got carried away with the second hunger strike: let’s put it that way. But retreating? Chapayev never retreated. So the only way was forward. The main objective was to attract attention, to shake up the situation somehow. Because getting results, especially in the first case, when it was a matter of custody measures, was totally unrealistic. All I was charged with (not what I did, but what I was charged with) was causing the bruise on the back of the hand of a policeman who in fact assaulted me. The policeman’s name is Alexander Ivanovich Algunov. He completely flagrantly hit me over the head with a truncheon. I had three lumps on my head, one of which clearly visible on my temple. It was both videotaped and photographed. And there were eyewitnesses who saw everything. But when it was matter of conducting a judicial review or investigatining this conflict… The bruise I allegedly caused the policeman was investigated by the Investigative Committee of Russia, meaning the country’s top investigative body. But what he did to me (and they believe that these actions took place at the same time) has been investigated by another committee. When I filed a written complaint against the officer, the case was not just dropped down to the municipal level, but to a neighborhood precinct, where an investigator wrote there was nothing to investigate. The bruise on the policeman’s hand was investigated by the Investigative Committee of Russia, while beating a person with a truncheon was investigated by a completely different division, the lowest on the totem pole, and it said there was nothing to investigate. I am simply a victim in the Bolotnaya Square case. But I was really visible in the video footage. I was in a confrontation with a policeman who was assaulting me. I grabbed the truncheon with which he was beating me, because at one point I nearly fainted. He hit me so hard on the head it felt like I had been hit with a sharp nail, not a truncheon. You were not the only victim on Bolotnaya Square, and yet the authorities investigated these incidents so unfairly. How do you explain this? In the trial documents, for example, there is this bit of evidence. There were two ambulance crews on duty on Bolotnaya Square. They kept a record of injuries in which they wrote down the names and addresses of everyone whom they examined. As far as I remember, there are forty-eight civilians in this list, who suffered something like seventeen concussions and thirteen head injuries and injuries to the soft part of the skull, meaning they had mainly been beaten on the head. There were three policemen who sought medical attention on the square. Of the forty-eight civilians, only two people were deemed injured parties by the authorities. One was hit in the back with a stone, while the other person’s trousers caught fire, and he suffered burns on his leg from a Molotov cocktail. We do not know who threw the bottle or the stone. The authorities assume it was the protesters, so only two individuals were deemed victims. The rest were not recognized as victims, because these forty-six individuals were victims of the police. Who the heck is going to investigate injuries caused by the police? That is not how things are done. The public commission who investigated the events on Bolotnaya Square came to the conclusion it was the Moscow authorities and police who provoked the confrontation? Do you share this point of view? I also came to the same conclusion. Only I think it was not the Moscow authorities, but the federal authorities [who provoked the conflict]. Moscow, in this case, did not have the authority to decide these questions. There were provocateurs there. I saw a man in a mask step forward, chunks of asphalt in both hands. At the time, I wondered what was so black, because I was looking into the light. At first, I thought he was throwing black earth, because the asphalt everywhere was so clean. This guy stepped forward and tossed one stone. Then he shifted a second stone [to his throwing hand] and threw the second stone. A policeman was standing there. I was standing there looking back and forth between the two. Either I should have said, “Why are you tossing stones?” or I should have gone up to the policeman and said, “Why are you just standing and watching?” The policeman saw what he did, and then turned around and walked away. The police were completely uninterested in the people who were actually throwing stones, just as the people throwing the stones knew the police were not going to do anything to them. Yes, and the most interesting thing is the authorities alleged the protesters shouted things about attacking the Kremlin and Red Square, and overthrowing someone. I was there. I heard no such cries. There are twenty-six hours of video footage in the case file. There are no such appeals in that footage. When the police cordon fell apart, people did not run to the bridge. This is clearly visible in the footage. People who were squeezed out of the crowd ran ten or fifteen meters away, because there was a crowd behind them and the danger of being crushed. Then, at a leisurely place, these people fixed their clothes or tied their shoelaces or something, and headed towards the square. This, too, is visible in the footage. Yet the investigators continue to claim, and the courts have not refuted it, but take it as a proven fact, that people were shouting to run across the bridge somewhere and were, allegedly, trying to escape. So it transpires the whole thing was a planned provocation. How do you explain it? What goals was the regime pursuing via this case? Has it achieved them? It was the first [opposition] rally after the elections. All the major protest rallies had taken place between the December [parliamentary] elections and the March [presidential] election. May 6, 2012, was the eve of the presidential inauguration: the regime no longer had anything to fear. If they had used force before the elections, naturally, it could have turned against them. But there was nothing to fear after the elections, so they were going to put the heat on people and arrest them. This was followed by the adoption of a series of repressive laws and amendments to the laws on elections, and pickets and demonstrations, not to mention the fact they introduced Criminal Code Article 212.1, which they used to put away [Ildar] Dadin. You were not detained immediately after the events of May, but around five months later. Did you follow what was happening to the guys who were arrested first? Were you afraid you might become a defendant in the case? Of course, I followed what was happening. I went and picketed outside the Investigative Committee building. I had this routine: one evening at home with the family, the next evening I would go picketing, and so on. At first, I did not take it very seriously. Why did they take so long to arrest me? First, they checked out everyone who had been detained on Bolotnaya. Despite the fact I had been detained, there was no arrest sheet on me; I had refused to sign some of the pages. They tossed out my arrest documents, and so it turned out I had not been detained. So, apparently, this was the reason it took so long to track me down. But the problem was that I was all over the footage. Despite the fact I inflicted no blows—I would like to emphasize I inflicted no blows, and I am absolutely certain I caused no physical pain to any policeman—I did try and prevent them from assaulting other people. I used my hands to restrain the police. Afterwards, when I found footage of myself on the Internet, I thought to myself: yeah, that was me in action. My emotional sense was that I had prevented beatings without resorting to violence. But when I watched the videos, I did think I had reasons to be worried. But I decided what was the point of worrying now? I should have thought about it then. Four years have passed, but the authorities are still prosecuting people [as part of the Bolotnaya Square case], people whose cases have not even gone to trial, for example, Dmitry Buchenkov and Maxim Panfilov. Do you think this will go on for a long time? No, I don’t think it will go on for long. They are just running on momentum. The case is not so interesting nowadays. There are many new, interesting articles [that have been added to the Criminal Code]. The authorities can charge people to their heart’s content: for slander, for incitement to hatred. The amended laws have now given them such possibilities they can put away any person who says anything the least bit negative or critical. The latest cycle of elections has kicked off. Considering all the new legislation and the overall climate in the country, what should we expect from these elections? Basically, the alternatives are this: either just one opposition party will be seated in the parliament or it won’t. There are also the single-mandate districts, which also helps. A party might not get its list into parliament, but someone can get into the Duma by winning a single-mandate district. I have read that [Alexei] Navalny is inclined to boycott the elections. I understand his resentment: his party was not registered, and he himself was not admitted as a candidate. But there are other parties besides his, and they are also opposition parties. I think all fourteen percent [of Russians who, according to the country’s extremely problematic opinion polls, disapprove of President Putin’s performance] definitely have to go and vote. Anyone who can do it should be an election observer, because it is not enough just to go and vote; we also have to monitor the vote. In the current circumstances, the authorities just cannot do without electoral fraud. Maybe we have few opportunities to stop the fraud, but we have to record the incidents and talk about them. Of course, it is very unpleasant the Democratic Coalition was not able to pull it together, but the law is such that for this to happen, people would have had to join another party. Unforunately, the majority was unwilling to do this. I think they should have come to an agreement whatever the conditions, but they didn’t. As I understand it, this is part of the old conversation about attempts to unite democratic forces, which have been going on since the 1990s. First, the law is wrong, because it does not allow electoral coalitions. Second, in my opinion, there should be no minimum barrier [for being seated in the Duma] at all. Democracy is a regime in which decisions are taken by the majority, but the problem is the majority is quite often mistaken. For example, on the stock exchange, the majority always lets the big money get away. The minority turns out to be on the money. The majority differs from minorities in the sense that there is one majority, but there can be two, three, four, five minorities, and so on. The minority has to be allowed to speak its mind, and then, perhaps, the majority will reorient itself. So there should be no barriers. The only barrier should be each physical person. The current laws, naturally, are designed to monopolize power, which is convenient to those currently in power. So they have no need of any competitors. Competitors are harassed, persecuted, and forced off the road. As far as I know, you were educated as a physicist and worked in science for a long time. How did it happen that you switched from science to grassroots activism and began following political events? What prompted you to do this? A profession is a profession, but one’s own opinion is something else. I first served as an elections observer in 1989. I was still working at MEPhI (Moscow Engineering Physics Institute) then. One thing did not interfere with the other, and it even helped. I left science, because salaries in the field had completely dried up, and I completely lost interest in what I was working on at the time. There was no future in it. In 1989, I was a member of an election commission for the first time. I went and found the election commission myself. It was perestroika. People had serious doubts and asked what perestroika was all about. They said perestroika would rearrange everything, but everything would be the same, [the Soviet Communist Party] would again get 99.9% of the vote, and so on. Those were the first actual elections, when Sakharov was elected [to the All-Union Congress of People’s Deputies]. What pleasantly surprised me was that there was no electoral fraud at all. In the evening, MEPhI’s Communist Party organizer came to check out the polling station, to see how we were doing. I tensed up, thinking that now they would come up with something. Nothing of the sort! I kept my eyes peeled. Everything was clean. But in 2011, when I also worked as an observer, everything was dirty, beyond dirty. It so dirty that, for example, there was an old woman, an observer from United Russia, working at our polling station. She did not get up to any tricks herself, but she would come up to us and say, “What is she doing?! Imagine the insolence!” She was referring to the woman who chaired our election commission. The old woman was indignant, her blood was boiling, but it did not go beyond that. She was already quite old, but [the electoral fraud] itself was too much for her. I was very glad a United Russia party member was outraged by our chairwoman’s behavior. During the four years you spent in custody, how hard was it to get information about what was happening in Russia? How did you find out about events? What events during this time amazed you the most? I was given subscriptions to Novaya Gazeta and New Times, although they only started to come regularly when I was in the penal colony. I would read these periodicals and try and watch the news. In some places, this was easier; in some places, harder. For example, the last three months, I was basically without TV, because the guys did not want to watch any news. They would turn on MUZ-TV, which would be spinning a popular music video for the hundredth time. I could not stand to listen to it. But the TV, as you know, is a biased source of information. As for events, of course, the annexation of Crimea and the war in Donbass. Incidentally, there were lots of Ukrainians in the penal colony, because the border is nearby. There was a guy in there who was himself from Russia, but his wife was from over there: he had got married in Ukraine. There was fighting in Kramatorsk. I asked him, “When were you there last?” He said, “Five years ago. Everything there was fine.” “Are Russians harassed there?” I asked. “Are you kidding?” he said, “Everyone lived in perfect peace. There were no problems at all.” Meaning no one discriminated against anyone, neither Russians nor Ukrainians. Where did this all come from? Why does the TV tell us that certain people are in danger there, that there is hostility? Russian TV has been kindling hostility between two sister nations. You cannot just go to war for their “bright future,” if everything in their country is okay. They have to say that everything there is bad. You served your sentence in two penal colonies. Is it true that there are totally different rules depending on the colony? The rules are different. That is why they say there are “red” colonies and “black” colonies. But those are the extremes, as it were, because the spectrum is continuous. The penal code is one thing, the laws are another, and if they were all obeyed, then it would make no difference where you did your time, but in reality the differences are fundamental. There is constant trench warfare between the convicts and the wardens over wrestling themselves more rights or forbidding more things. Figuratively speaking, for example, in one colony, the convicts march in formation, while in another they don’t. Even on this primitive level, marching in formation or not, there is constant conflict. The convicts try not to march in formation, while the wardens try to force them to march. It turns out different in every colony. And that applies to everything else. Considering you were convicted as part of the Bolotnaya Square case, how were you treated in these colonies? Was there any talk about the fact you were basically a political prisoner? The majority could care less. But some talked about it, especially in the pretrial detention facility, where I would come across sensible people. We would talk about who had been convicted and was doing time for no reason at all. When I was in the pretrial detention facility, it seemed there were many such prisoners. First, this was Moscow. Second, I was told, roughly speaking, that the accountants were on that floor, members of some other profession were on some other floor, and so on. Seemingly around thirty percent of the prisoners were in there for nothing. But when I got to Bryansk Region, this figure was no longer thirty percent, but much lower, somewhere between five and ten percent. A lot of guys were in for petty theft and drugs. Over a third were doing time for drugs. 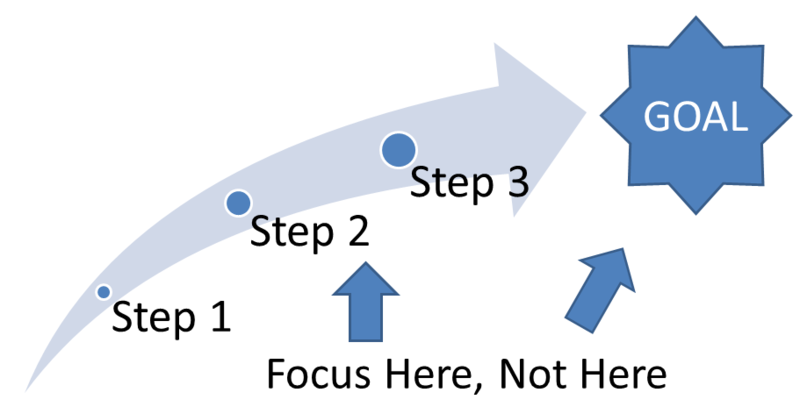 Realistically, a maximum of ten percent were doing time for nothing, or even five percent. As for how I was treated, well, I was repeatedly on the verge of a conflict. There were conflicts. With the convicts or the wardens? With both the wardens and the convicts. It is just that the wardens foist their rules on you, and the convicts foist theirs. You are a free man, and you realize you cannot abide by either set of rule.s So you don’t want to carry out either set of orders, and you start weaving and dodging. I was involved in several conflicts of that sort. My age was my salvation. Basically, there are all sorts of kids in there, and they could not bring themselves to hurt old people. Or rather, they could: I saw sixty-year-olds get beaten up in there, but it was still much more complicated. They also look at what you have been sent down for, although I cannot say it is so meaningful. But in this case it was a factor that worked in my favor; it was meaningful. I did not conceal the fact I had not assaulted any policemen, but a conviction is a conviction. Now you are free and in Moscow. What are your plans? Do you see a future for yourself in Russia? Have you had thoughts of leaving the country? By and large, I realize it is not recommended to live in this country. If a person has the opportunity and the desire, it is in his or interests to emigrate. But I somehow feel inherently Russian. I am afraid in any other country I would feel like an immigrant, an alien, if not like a guest worker. I cannot imagine living somewhere else. I feel it is okay to emigrate, and some people should emigrate, but I am afraid I am incapable of it. 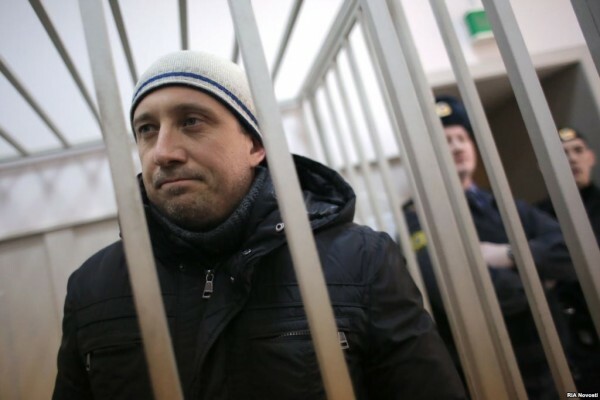 Sergei Krivov is the twelfth person convicted in the Bolotnaya Square case to have been released from prison. A total of thirty-five people were prosecuted as part of the case. Thirteen of them were amnestied. Eight people remain in prison or under investigation. 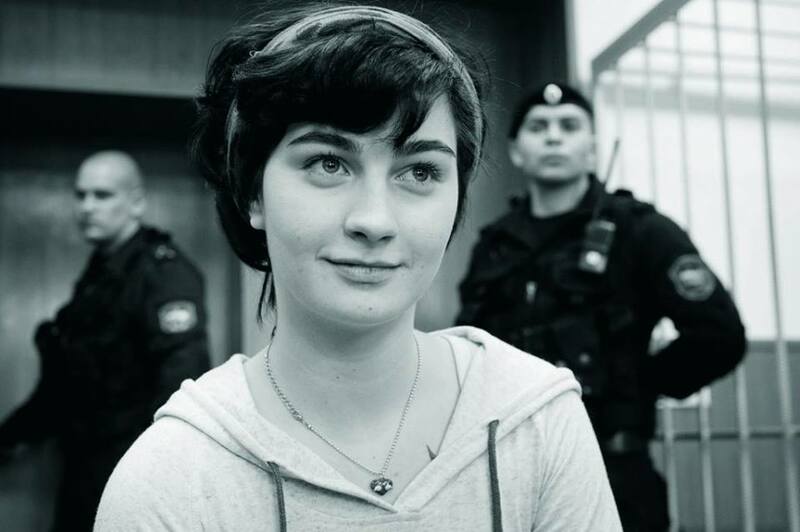 This is Alexandra Dukhanina (aka Alexandra Dukhanina-Naumova and Alexandra Naumova, since she was married after her arrest), one of the eight people declared guilty by a Moscow court, yesterday, February 21, 2014, of “rioting” and “assaulting police” during a sanctioned opposition demonstration on May 6, 2012, in central Moscow. Although Dukhanina and her fellow dangerous criminals were found guilty on Friday, the court has “cleverly” delayed the sentencing hearing until this coming Monday, that is, until after the closing ceremony of the Sochi Olympics, President Putin’s lavishly expensive celebration of his allegedly triumphant reign. It is entirely likely that on Monday Dukhanina and her co-defendants will be sentenced to five or six years in prison. This is the punishment that prosecutors have asked the court to impose on them. Dukhanina’s real “crime” is that she dared to challenge — peaceably and legally — President Putin’s triumphant “re-election” the day before his inauguration. She did this along with tens of thousands of other people, but she and her co-defendants were seemingly randomly picked out from this great mass of folks and arrested, held interminably in pretrial detention (or, in Dukhanina’s case, under house arrest), and over the past few months, subjected to a senseless show trial. The authorities, apparently, wanted to make examples of them, to show the greater public that this is what happens to “ordinary” people when they oppose supreme political power and get mixed up in the “dirty” business of politics. As anyone who has been following the Bolotnaya Square case can tell you, however, Dukhanina and her co-defendants are anything but ordinary people. They’ve consistently shown themselves to be courageous, intelligent, funny, and indomitable folks, extraordinary models of solidarity, and an inspiration to their fellow citizens and other “ordinary” people everywhere. More than anything, Dukhanina and her comrades show us what Russia could look like, what it will look like, when the Putinist tyranny has ended. But don’t believe us. Read the closing statement Dukhanina made to the court earlier this month. I would not be following these events so closely myself did they not concern me personally. But my fiancé, Alexei Gaskarov, is under investigation and in police custody, and I have no choice but to monitor the “Trial of the Twelve” carefully in order to gauge my chances of seeing Alexei freed as soon as possible. All this time I have deliberately avoided going into the courtroom at the Moscow City Court where the Bolotnaya Square case is being heard, preferring to watch the live broadcast in the court hallway or observe the circus from the press balcony. If I had the chance not to go to the court hearings in Alexei’s case, I would skip those as well. It is one thing to talk with the emotional parents of the prisoners outside the courthouse and see photos of the defendants in the press, but quite another thing to see relatives and loved ones silently communicating through the glass of the “aquarium” in which the defendants are caged during the hearings, and realize they have had no other means of supporting each other for over a year now. Yesterday, August 29, I went to the trial to keep Tanya Polikhovich company. 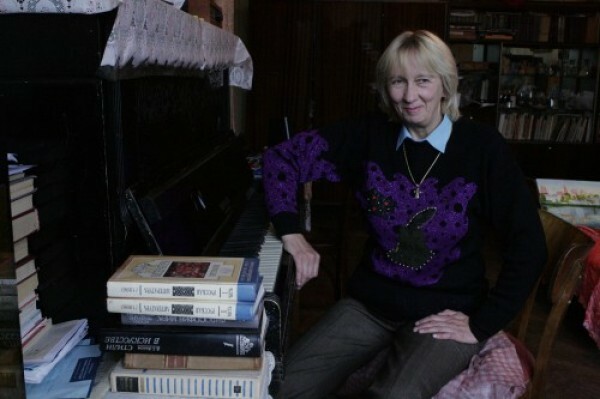 It was the birthday of her husband, Alexei Polikhovich, one of the twelve defendants. Alexei’s dad, Alexei Polikhovich, Sr., happily greeted us in the hallway of the court. Yaroslav Belousov, Andrei Barabanov and Denis Lutskevich were seated in the dock closest to where I was sitting. Alexei Polikhovich sat in the farthest section of the dock. Tanya attracted his attention by waving to him. Then she unfolded a t-shirt with Dandy the Elephant emblazoned on it. Polikhovich gave a two thumbs-up sign: the t-shirt was a birthday present for him. Lutskevich kept his eyes glued on his lovely mother, Stella. Throughout the hearing they would surprise me with their amazing ability to hold a conversation merely by glancing at each other. Andrei Barabanov was looking at other people in the gallery, because his girlfriend, Katya, is unable to attend the hearings: she is an official witness in the case. While I was examining the animated faces of the guys in the dock, Judge Natalya Nikishina entered the courtroom. As always, defendant Sergei Krivov addressed her. “Shut up, Krivov,” the judge cut him off. 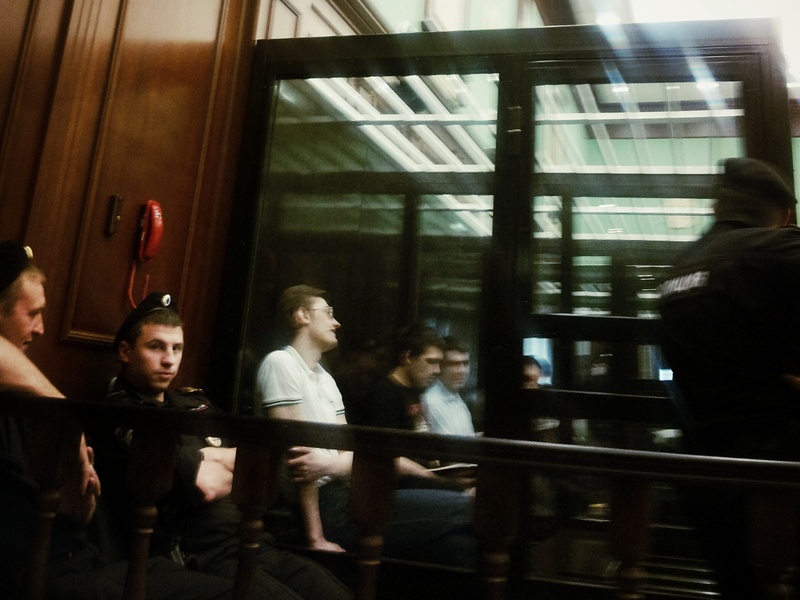 Then the testimony of the sixth “victim” in the case, riot police officer Alexander Algunov, began: the case file contains a medical certificate stating that his right hand was injured during the alleged “riots” on May 6, 2012, in Moscow, during a sanctioned opposition march. I stopped listening to Algunov’s monotonous, muddled testimony and looked back to the dock, making eye contact with Lutskevich. Denis smiled broadly, and I wrote the phrase “Gaskarov says hi!” in big, block letters in my notebook. I tried to quietly raise my postcard so the guys would see it, but the bailiffs noticed it as well. “Well, now they’ll kick me out of the courtroom,” I thought, and a bailiff, dressed in black, moved towards me. I put the notebook away and got a warning. The bailiff took up a spot next to the glass cage, blocking my view of the guys, but they leaned forward and, peering from behind him, waved at me and smiled. While this was going on, the state prosecutor was asking to hold a police lineup right in the courtroom, despite the fact it violated court rules. As always, Makarov, who is defending Krivov, was completely prepared to cross-examine the victim, but as the hearing entered its sixth hour, people in the court gallery interrupted his cross-examination. Two young women jumped up on their seats and began singing “Bella Ciao,” the Italian Anti-Fascist Resistance song. But they did not succeed in unfurling a small banner congratulating Alexei Polikhovich on his birthday: six men in plain clothes grabbed them and removed them from the courtroom, along with everyone else in the gallery, including the relatives. Artyom Naumov, husband of Alexandra Naumova, recognized two of the men as people who had carried out a search at Alexandra’s apartment. Everyone was now standing in the hallway, and the parents were upset. It would have been better to stage the unsuccessful performance after the hearing was over. Alexandra Naumova left the courtroom, and the judge announced a recess until next Tuesday. Before leaving, Judge Nikishina remarked, disgruntled, that come September, hearings should be held five days a week to get this over quickly.